Since you’re skeptical (and I would be, too) – take a look at this study. The study was completed at Purdue University and published in 2007. The researchers assigned men and women to a 3-day per week workout schedule, where subjects would compete a resistance training circuit. The workout program wasn’t the best, but the results showed these men and women were able to gain an average of 4 pounds of muscle and lose 4 pounds of ugly belly fat in just 12 weeks. As a result, their body weight didn’t change, because they gained the same amount of muscle as they lost in fat. Now that you agree that you can put on muscle while shedding fat at the same time, I’ve discovered a way to do it even faster, all while improving your conditioning, stamina and endurance. They are metabolic finishers with a NEW anabolic approach. 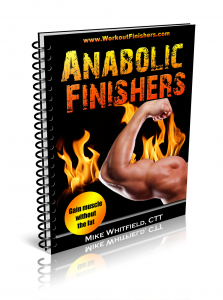 In fact, the finishers inside this manual will help you pack on LEAN muscle without the fat… and even lose fat while gaining muscle. P.S. There is NO RISK at all for you to try this Metabolic Finisher program. If you are not thrilled with Anabolic Finishers in 60 days, let us know and we’ll refund every penny. Your satisfaction is 100% guaranteed. My workout programs have already been seen on Men’s Health, Turbulence Training and used by thousands of men and women, and I guarantee it will work for you, too.